Mizutani Shizuku is the type of person who only cares for her own grades. But when she is asked to deliver lesson notes to Yoshida Haru, he becomes convinced they are friends. Haru turns out to have a very naive personality, but who would've thought that Haru would actually confess his love for Shizuku? 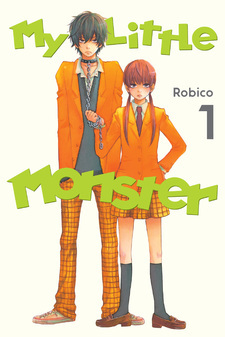 Tonari no Kaibutsu-kun was published in English as My Little Monster by Kodansha Comics USA from March 11, 2014 to March 29, 2016. It has also been published in Polish by Studio JG since November 9, 2015, in Russian since August 12, 2016, and in Spanish as El monstruo de al lado by Norma Editorial since October 2016. I finished the whole series in just a shorter amount of time than I had expected it to. Yes, this is that good, and I feel that I had to write a review when I am done reading it. First off, Tonari no Kaibutsu-kun is absolutely one of the most beautiful mangas I have ever read! This is one of those mangas that is so heart warming and relateable. You can feel as though you can understand the thoughts and feelings of the characters. I liked how the story was not only focused on the love story between the two main leads. This series is so much more than a shoujo manga, it also deals with learning about life, valuing friendship, overcoming challenges and finding your own identity. This is how high school life and romance should be written, since it has utterly captured the beauty and the struggles of it. The character development was brilliant and every single one of them was my favourite. The art was also amazing and it kept on getting better with each volume. The final volume was really special, and I just loved how it ended so perfectly that I would not have preferred a better and more touching ending than this. Like all the stories I have finished reading, I am quite sad that this series has to end. It was great, fun and unique in its own way. I thoroughly enjoyed reading every page of it. I could have wished for more chapters since I want to see more of it. Oh, and the anime was awesome as well! :) I am definitely going to miss Mitty and Haru-chan! Tonari no Kaibutsu-kun is probably a manga I won't forget. Despite it having a simple premise and characters that have stereotypical archetypes (Shizuku being a study bug, Haru being an eccentric softie, etc) I still enjoyed this so much because it was executed nicely and, true to the description provided by MAL, a fresh take on your typical tsundere girl x dere boy romance. The characters are definitely the best part of this manga. Though they aren't groundbreaking, their interactions with each other and how each of them influenced the other characters (directly or indirectly, knowingly or unknowingly) felt so honest and true to what high school and youth in general is like. Unlike other shoujos I've read that were so dreamy and impossible, it felt as if what these guys went through and felt could actually happen to you in real life (and some of these things probably have). I especially loved the dynamics of the main protagonist "quartet" (Shizuku, Haru, Natsume and Sasayan), who befriended each other regardless of their differences academically, socially and as a whole -- though this manga focuses on the relationship of Haru and Shizuku, I'm also glad that the mangaka took the time to show us through these four that love can also come in different forms and people, not just in a romantic way, and change us just as equally. Though Haru and Shizuku would definitely be different if they hadn't met, the fact that the people around them were just as important and that they weren't the only people in that world was what made this manga stand out to me. On that note, the story and writing is probably the epitome of what "slice of life" is. It's slow but mellow, and it ultimately doesn't make you feel as if you're reading filler. The conversations and events that take place are meaningful and there are quite a number of quotable sayings from this manga, at least for me! It was also really funny and sweet, enough to make me giggle at the awkward moments caused by a lot of characters' inexperience (especially Shizuku) when it comes to relationships with others, and even laugh whenever anyone (shout out to the Natsume-Haru duo!!) would do something wacky. Though this work is primarily narrated by Shizuku, whenever it shifts to another person's view for a chapter or two, it never feels out of place and it flowed really nicely overall. The art was just as wonderful! It was clean and pleasant to look at, and the character designs really fit each of their personalities. (I'll be honest, I looked forward to whenever Natsume came "on screen" because her clothes looked so fun and very fashionable, compared to the modest Shizuku, who dresses like a grandma!) Also, the backgrounds were detailed, and the overall quality was just really great and consistent. All in all, this is a really enjoyable manga! Though there's certainly romance involved, this manga is about love in general, what it means to truly reach out to someone and what your relationship with that somebody does to you and others as people. It's nothing overly convoluted, but it's not that simple, either. It's a fun read and definitely worth a glance if you have the time. This may be a shoujo, but I'd recommend it to anyone who wants to read something a little more unique. Before I begin this review, I would like to say that I literally just binge read the whole series, even chapter 52 which updated TODAY. I saw on mangahere that this series was going to end soon, which is did in chapter 48, but I waited it out till now so I can have a fresh perspective on it. I shall avoid major spoilers of course, but I am planning on writing a very lengthy 'rant' blog on this (once I find more time) because I'm not exactly too happy with the story (even though I enjoyed it). So... let's begin. - Love at almost first site. Yoshida, the cute delinquent turned sweetheart, "falls" for the cold Shizuku. Please read the full synopsis on the manga page. The plot wasn't too complicated. Romance wise, the story makes it quite linear who ends up with who, but the reoccurring themes about individuality and friendships. I had read through a few forums and this manga was a reoccurring title in which the internet seems to love and adore. Judging the book by it's cover, I automatically assumed ------- Character Section ----------. The overall summary sounded decent enough and I was expecting a SUPER COMPLICATED PLOT. Thank goodness it wasn't. - JUDGING THE BOOK BY IT'S COVER, I AUTOMATICALLY ASSUMED... (without reading the summary) that Shizuku and Yoshida were delinquents considering she has a dog collar around him and he looked menacing enough. I was wrong of course. I'm picky when it comes to manga series that expect me to take hours out of my time to read. Usually once I read the first chapter, I either continue or I stop right there. I considered stopping for this manga. The characters to me, at that point in time which was roughly 3 hours ago, had no potential to grow in an exponential way for the next 51 chapters. "Why's she so picky?" you may ask. Like video games, I like spending money on one game with replay value so I can get my $60 worth as opposed to spending money on multiple cheap games that I'll only play once. I've read a lot of manga already so now I'm just being picky on what I want to spend on leisure time reading. Back to the characters. Shizuku is a cold person who is more aware of some emotions around her. She's straight forward and in the beginning likes to put a distance between her and other people. Seemingly enough, all she did was study as opposed to having fun. I found her character to be bland. She does however develop once their social group expands, but she wasn't my most favorite character. Yoshida (Haru, either or) was a character I didn't like. People who have read this series would be all "WTF IS WRONG WITH YOU HE'S ONE OF THE MAIN CHARACTERS AND IS SO SWEET ASDFGHJKL!" His character was flawed from the beginning being that he is a violent person to start out. However, in a few chapters it all changes and he becomes less violent and less scarred and it's as if that Haru who had potential for psychological development never existed. He was a sweetheart with a blunt mouth, but after the change from delinquent to puppy, his character stayed linear for the rest of the series. A character that I did like a lot and was shipping with Shizuku, like, REALLY hard, did not get a fair trial. Yamaguchi (Kenji) was a pretty forgettable character in the beginning. I didn't start liking him until 1/3 of the way through because he got no page time before that. I thought he was just a side character (or an extra) because of his lack of presence in the beginning, but once Robic(k? )o, the mangaka, changed the pace of the story by having him come out as "I MAY SEEM LIKE A JERK AND I AM BUT I REALLY AM A PRACTICAL AND SWEET GUY AT HEART," I was sold. I wish the ending after the official end did him justice, but alas, it was not meant to be. Tonari no Kaibutsu kun was a sleeve that impressed me a lot, especially because I had only seen the anime I've ever liked but ended endless so for me it was a very good surprise. 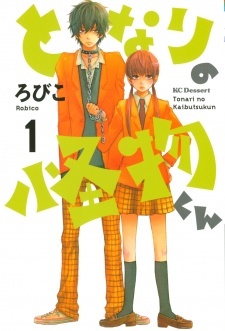 Tonari no Kaibutsu-kun revolves around the daily lives of some high school students with serious socializing problems. As they go through their normal lives, they spill out pretty good quotes that can be applied in real life situations and will surely hit home. A series background of the anime "Tonari no Kaibutsu-kun" and other heartwarming slice-of-school life anime that won't make the jaded viewer physically ill.